This weekend my friend and I went furniture shopping. We came across the spool chair. When we sat in it and I couldn't get over how comfortable it was!! She has been looking for a comfortable chair for her bedroom where she can sit and read and we both agreed that this chair could be a contender. The great thing is it's versatile, it could easily fit in a living room, family room or study setting. Here are some of my favorite images. Hickory Chair probably has the best spool chair out there. Timeless and great quality. A piece you'll have forever. 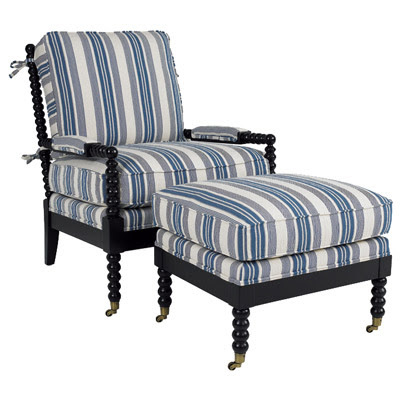 On their website, you can picture the chair in any finish or fabric of your choice!! Simply click on the 'Personalize this item' button on the top right hand of the product page, like this one. Layla Grace carries both the chair and the ottoman with many fabric options. 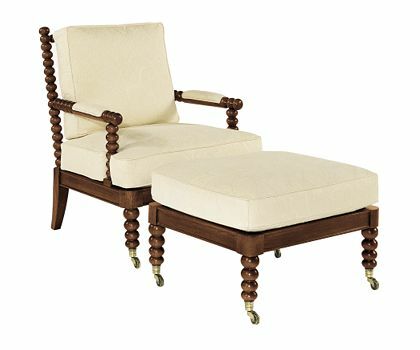 The Wisteria chair is currently out of stock which is not surprising for $600, however I think not having padding on the arm rests would bother me and the fine print 'assembly required' worries me. I found this one on clearance for $800. Are you a fan? Do you own one? I'm just crazy for these! I only wish I was lucky enough to discover one at a thrift or secondhand store...did your friend take it? 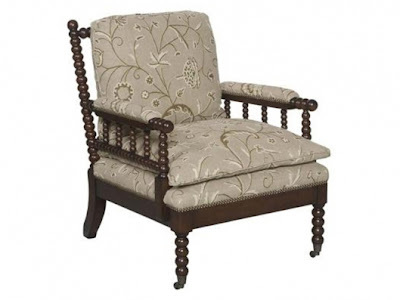 Would love to a spool chair because they are comfortable and they don't take up a lot of visual space. Hickory chair is next door to me at furniture market and a friend of mine works there. Wonder if they have a sample sale? Fran I adore the spool chair with casters; a classic! I would love to own one... how versatile with its gorgeous turned legs! I have always wanted one of these chairs! Someday, I will have one! Oh yes! I love them too and was also looking at the Hickory (inspiration photo was the second one you listed which I tore out of who-knows-where years ago -- LOVE that room). Anyway, too expensive for my blood, so when I found some vintage bamboo chairs, recently, I bought those instead. Same open feel. Still would love the spool chair, though...I hope your friend gets it. She'll love it! 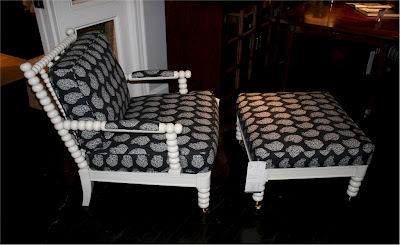 Thanks for your sweet comment on my guest post today at Strictly Simple Style :) I love these chairs, they make such a statement in a room. Plus, they fit in well with many different design styles. No, but I would love to! Definitely stylish, and totally timeless. Two of my favorite things! your money will come back to you thanks to those followers. will feature you on the Digg homepage and you will surely have increased number of followers on twitter. I redecorated our “master” chair nearly a year ago and I’m really crazy about it. I went with gray, green and black and used some bird decals on the wall. Once your wound has started to heal, a scab may begin to form and new skin may start to grow. Which ever method you may choose skin tags can be removed. substantially. The duration of the treatment varies depending on the treatment facility involved. The London Factory stocks this wonderful chair. Very high quality built and the price is very competitive. We have it in our lounge and absolutely love it.